Hungry? A cookbook by Innocent and a few month's worth of Innocent Juices. One lucky winner will win a copy of Hungry? 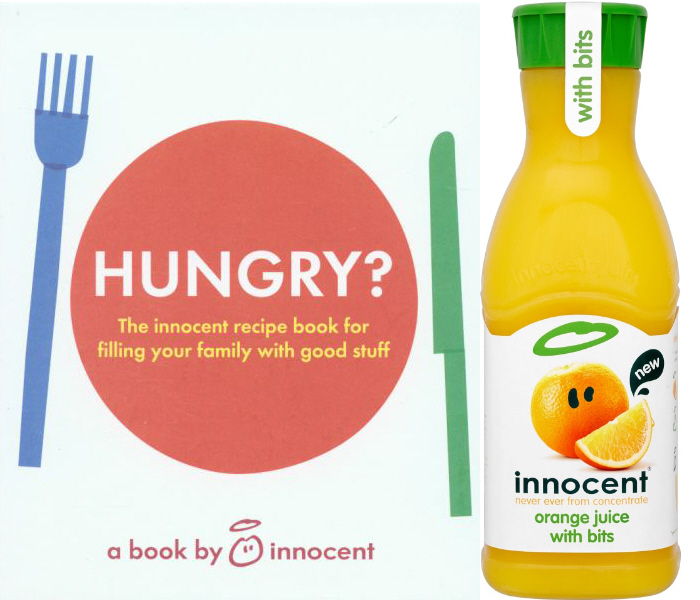 a cookbook by Innocent and a few months worth of Innocent Juices, which are just perfect over the festive period for cocktails and 'the morning after' pick me ups. I am a great lover of Innocent drinks and smoothies. In fact you will only ever find Innocent orange juice in our fridge and I have a copy of this cookbook on my bookshelf. The book too is rather wonderful and whimsical with colourful illustrations, photos and tips throughout, in among the simple, but delicious family recipes. 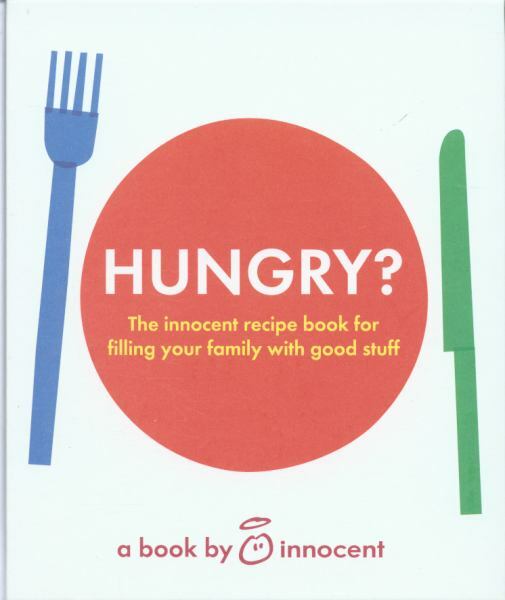 "The innocent recipe book for kids' is a brilliant source of classic, smart meals and drinks for the whole family from quick breakfasts, snacks-on-the-go, to clever lunches and big dinners all served up with the innocent twist. Including a separate section on food for journeys, top tips to bag your five-a-day with minimum fuss, helpful portion ratios in relation to children's ages, a clear breakdown of seasonal food and some clever solutions to overcome the resistance of the most reluctant diners, this book informs about healthy eating habits and fully engages children in the cooking process." Disclosure: Innocent did not pay me or send my any goods for this giveaway. The prizes are purely for my readers. I was not expected to write a positive review and any opinions expressed are my own. Can I win for a change please? My daughters love innocent juice! Looks good would love to try some of the recipies ! Fantastic giveaways you are arranging. Big fan of the innocent range, the drinks are so delicious and healthy too. I suppose using a fresh juice like innocent/similar quality would make much nicer Bucks Fizz instead of just buying it ready made. Best cookbook ever! Such a refreshing change from all of the usual cookbooks and written in such a fun and creative way. Some beautiful recipes - my kids loved the breakfast muffins and flapjacks! I had no idea they produced a cookbook, I'm intrigued! Sounds fab - love innocent juices! 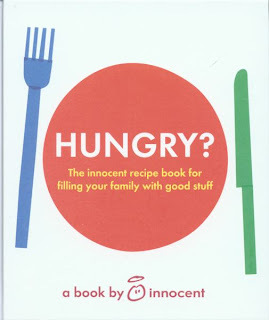 I'd give the book to a friend who's expecting, since I don't have kids, but I live off Innocent smoothies. The kiwi & lime is my favourite. Would love to get that! Great time of the year to win juices. Really need the vitamin C! I've got the Innocent Smoothies book, which is really good, hoping this is similarly. My son loves these juices, he is a nightmare for eating veg or fruit so at least with these I feel his is getting some of his required vitamins and minerals!! My family love these juices, so refreshing! This looks like a great prize. We love innocent juices - especially the raspberry and apple! Another fab prize. We all love innocent juices and smoothies. Great prize from a great website. I'm a big fan of Innocent-have my Rainbow Guides knitting bottle hats as if their lives depend on it!Natural,tasty ingredients and produced by a fun company for whom I'd love to work. 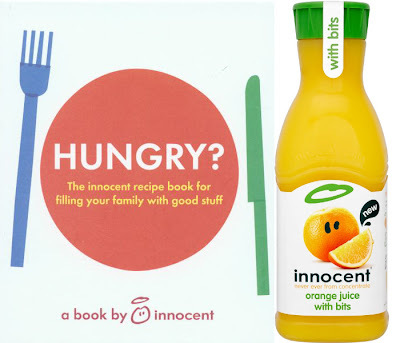 love Innocent juices - the book sounds great! Love Innocent juices, great flavour combinations. It'd certainly save a wad of cash to spend on christmas pressies. Great prize, love Innocent. Been to a couple of their fetes in London too! This is a great giveaway. I love these. Love these - brilliant prize! There is no such thing as too many cookery books! I LOVE Innocent drinks! Fingers crossed! Now i have a teenage daughter who loves her veg but i really struggle to get any fruit down her and Innocent smoothies help! Another handy and yummy prize - thanks for the great giveaways! What a lovely prize, I'd love to win. Excellent, a healthy start to the new year! Love Innocent products - am even a fan on fb! I absolutely love Innocent smoothies - I bet their juices are good too! Thank you for holding these giveaways! Ooh would love to win this, Innocent juices are my absolute favourite! Innocent are slightly less so when they meet my friend Vodka! Love juice, even without. can never have enough cook books! In this house we need fresh juice every morning! Great. Innocent Juices are delicious. Lovely giveaway, we love innocent juice in our house. Great prize,I don't drink fizzy drinks and love juice.